steps to ?T? and all modern conveniences. Condo offers: flexible floor plan, bright space, gleaming hardwood floors, freshly painted, new windows, over-sized eat-in kitchen w/newer appliances, old world charm ? 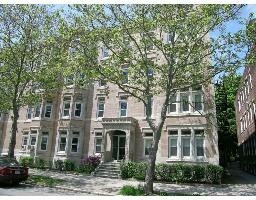 high ceilings, laundry in building, & 3 months pre-paid direct access rental parking. Ask broker - storage & more parking available. An outstanding starter condo ? move right in !! Motivated Sellers - Bring offers!